FILE - Billionaire investor Wilbur Ross departs Trump Tower after a meeting with U.S. President-elect Donald Trump in New York, Nov. 29, 2016. When billionaire investor Wilbur Ross salvaged two North Carolina textile mills from bankruptcy in 2003 and 2004, one of the first things he did was head to Washington to immerse himself in trade law and policy. China's accession to the World Trade Organization had unleashed a flood of textile imports across U.S. borders, and Ross — now President-elect Donald Trump's pick for commerce secretary — took an unusual hands-on approach, advocating for "safeguard" tariffs to help the ravaged domestic industry. "He was not the first outside investor to come into the industry and buy a major asset. He was the first and, to my knowledge, only major outside investor who took on that same sort of attitude that the more homegrown CEOs had," said Auggie Tantillo, who has lobbied for textile makers in Washington for almost 40 years. Ross' history owning and defending embattled steel and textile manufacturing companies that have relied on border duties to protect their industries means he will bring a unique approach to the commerce secretary job, departing from the traditional role of cheerleading for free trade and big business. FILE - U.S. President-elect Donald Trump stands with Wilbur Ross after their meeting at Trump National Golf Club in Bedminster, New Jersey, Nov. 20, 2016. In a questionnaire ahead of a U.S. Senate hearing to review his nomination — which had been slated for Thursday — Ross said he had owned or had a significant stake in more than 100 businesses over 55 years. Forbes has estimated his fortune at $2.9 billion. Ross has not yet provided the Senate with financial disclosures or an ethics agreement to prevent conflicts of interest. Late on Tuesday, the Senate Commerce Committee said it would postpone Ross' hearing until Jan. 18 to give more time to ethics officials to do their work. Ross is one of three wealthy Trump picks to run into delays with the vetting process. Education nominee Betsy DeVos and Labor pick Andrew Pudzer have also had their Senate hearings pushed back. The Economist has called Ross "Mr. Protectionism," a term Ross told CNBC he saw as "pejorative" and inaccurate because he said the threat of tariffs would be a used as a negotiating tool. If confirmed, Ross, 79, who is personally close to Trump, will be a lead player shaping U.S. trade policy, working alongside Robert Lighthizer, a lawyer known for his work with beleaguered U.S. manufacturers whom Trump has tapped as U.S. trade representative, and Peter Navarro, an economist and China hawk who will serve as a White House adviser. Free trade advocates worry the Trump trade triumvirate will be too quick to use tariffs to keep imports out, raising costs for manufacturers that rely on imported parts — or even sparking retaliatory trade wars. "The three of them — those guys put together —can create a lot of mischief," said Dan Ikenson, a longtime trade policy economist now with the Cato Institute think tank. Ross did not respond to a request for comment. A spokesman for Trump's transition team said Ross would draw on his experience "saving and creating" manufacturing jobs if confirmed, and would push to expand exports and reduce imports. 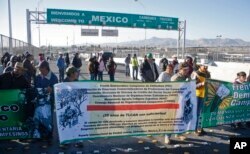 FILE - People belonging to farmers' associations block the El Paso to Ciudad Juarez bridge, on the Mexican side, during a protest against the North American Free Trade Agreement (NAFTA) in Ciudad Juarez, Mexico, Jan. 2, 2014. Ross has worked with allies in labor unions and other industry groups hurt by imports to push for tariffs and quotas, even starting his own coalition in 2003. Although the coalition was short-lived, Ross' trade rhetoric about the trade deficit and currency manipulation has remained consistent — and was echoed on the campaign trail by Trump. Ross called the 20-year-old North American Free Trade Agreement with Mexico and Canada the "poster child for unbalanced trade and investment," in a letter to The Wall Street Journal. He has accused Mexico of importing auto parts from China for vehicles it shipped duty-free into the United States. But his companies have also produced goods in Mexico. The 2007 annual report for his International Textile Group called NAFTA "advantageous to the company" because of its factories there. Ross supported the Central America Free Trade Agreement, saying he believed it fixed some of what he saw as loopholes in NAFTA. Ross has drawn an unusual endorsement — from the United Steelworkers union, which backed Trump's Democratic opponent, Hillary Clinton, in the election. Leo Gerard, president of the USW, said in an interview last month that Trump's team understood that trade remedy laws themselves needed to be modernized to make it easier to impose sanctions and duties before industries are hurt and jobs are lost. "We have a lot of suggestions for when there's a new trade team," Gerard told Reuters.